Studies have shown that introducing a child to sports programmes at a young age goes a long way to improve their health and fitness. The standard P.E. class a child receives at Primary School will be in a large group, and often lead by non-specialist staff, so it makes sense to supplement these with an after school soccer training program, where Coach-Player ratios, and the Coaches experience and expertise, will be more advantageous to a child’s development. Football is a fantastic way to get fit, delivering an all round work out for a child that cannot be bettered.Game play, match related drills, and specific skill routines , which are all part of the First Steps Soccer syllabus, mix sprinting with endurance work, to develop long and short muscle fibres and also aerobic and anaerobic capabilities. Throughout the course of the training year,through attending a weekly class and practicing at home, a participating child will see an improvement in their flexibility, cardiovascular capacity, and body composition (lowering the percentage of body fat while increasing muscle mass). Participating in a soccer training academy also helps improve a child’s sense of self confidence by helping them develop their social skills. Competitive, skills based team games and small sided match play, enable a child to interact with other children in ways they cannot learn in school, teaching them the value of co-operation, and the importance of reacting positively to failure . Independent skills practice, focussed towards specific goals and targets, promote self discipline, and foster the belief in a child that skill acquisition is rewarding, and worthwhile. Involvement in Sports outside of school help children create a better balance in their life, and a chance to get away from the academic targets that have become such a large part of primary school life. The chance to escape life’s stresses through sport and play has a big upside; studies have shown that children who participate in soccer training academies and competitive sports perform at an above average level in school. 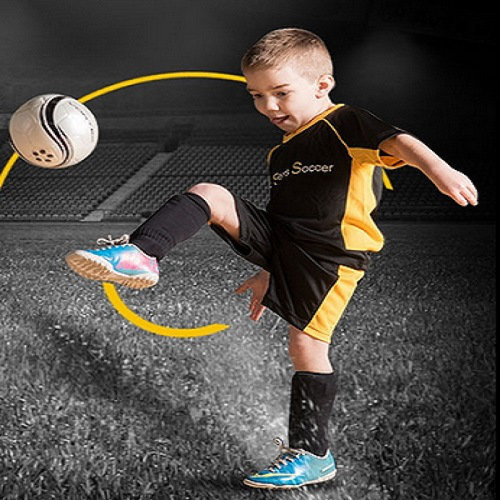 First Steps Soccer is Bristol’s premier soccer skills academy for children ages two to nine years old. Established in 2006, First Steps Soccer’s professionally trained and experienced coaches work with approximately 400 children per week, making it the largest private football/soccer academy for this age group in the South West. Weekly Lesson: Children participate in a minimum of 38 sessions per year, following the unique F S S Syllabus, with most taking place after school or during the weekend mornings. Preschool classes are grouped by age, with a maximum difference of around nine months between the oldest and youngest child. School aged classes are grouped by age, experience, and current attainment. All First Steps Soccer coaches have a minimum of 500 hours coaching time with two to nine year olds, with Head Coaches Joe and Mark Wenham having 3,000 and 6,000 hours experience respectively. Access Online to Coaching Videos: Parents have the ability to follow up their children’s training in class, and to promote focussed practice at home, through access to over 240 coaching videos, which are designed to support and compliment the training sessions. Skills Book: After their child starts sessions with First Steps Soccer, Bristol’s premier soccer training academy, parents will receive a skills book, which is appropriate for their child’s age and ability. There are eight books, each featuring 30 different key skills that correlate with the numbered coaching videos. Stickers: Each time their child masters a key skill correctly, parents will be able to give them a sticker to place in their skills book. This rewards their hard work and attainment, promotes practice at home, and creates a permanent record that children will hopefully look back on with pride, and a sense of achievement. When each book is successfully completed , a child receives an extra special large sticker in front of their class. First Steps Soccer believe that failure is an important part of the journey towards success, so we value great effort and positive attitude, just as much as actual attainment. To this end the hardest working child will receive a medal at the end of each class. I found myself suggested this website by my cousin and He told me its a best football coaching academy in England. Thanks!